By virtue of being a celebrity, media, and yes, paparazzi attention is invited. To an extent. Celebrities know they're going to be photographed at events, going to and from the gym, having dinner, and in some cases it's likely there is some orchestration going on in order to have the paparazzi take the right "casual" photo at the right "candid" time. We shouldn't be so naive as to assume paparazzi attention isn't sometimes courted, and often beneficial to celebrities, especially those with a new product to promote who might be seeking out space in the news cycle. But sometimes the paparazzi does go too far: giving the public a glimpse into your life doesn't mean that you can't also take that away when it suits you. Celebrities are, after all, human too, and are entitled to withdraw consent to having their privacy invaded. They're also entitled to not being stalked, hounded, and physically touched or intimidated by people taking their photo. More and more, celebrities are taking a stand when desperate paparazzi cross the line from tolerable to life-ruining, especially where it concerns their kids. 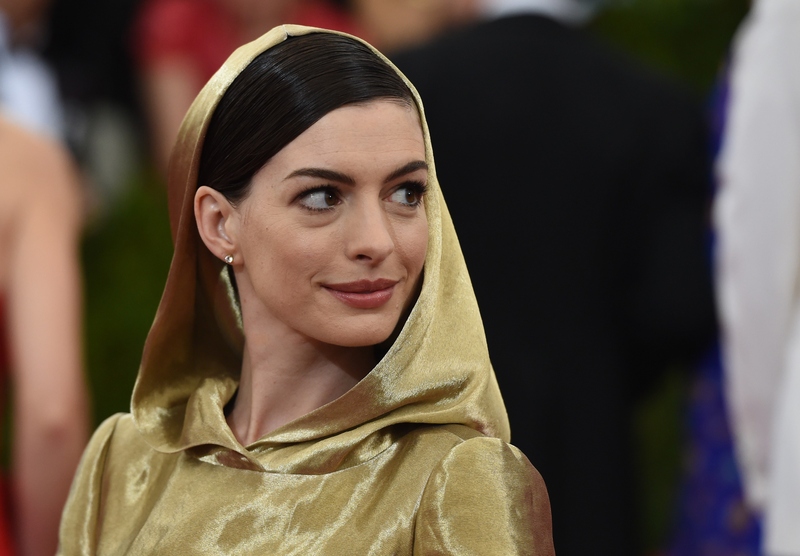 The latest celebrity to clap back (with style and class, might I add), is Anne Hathaway. Here's Hathaway's response to over-zealous paps, as well as 7 other times celebrities stood up to the paparazzi. Anne Hathaway is the latest celeb to call out the paparazzi invading her privacy. And in the articulate, infinitely cheery way only Anne Hathaway can, she managed to do it as gracefully as possible, and with little outward anger (although I'm sure some part of her was seething underneath, she's only human!). After the paparazzi snuck photos of her on vacation, Hathaway took matters into her own hands, and posted an adorably pregnant bikini photo of herself on the beach to Instagram as a means of controlling her own image. She wrote, "Happy 2016 to my beautiful Instafriends! So, posting a bikini pic is a little out of character for me, but just now while I was at the beach I noticed I was being photographed. I figure if this kind of photo is going to be out in the world it should at least be an image that makes me happy (and be one that was taken with my consent. And with a filter :) Wishing you love, light and blessings for the year ahead!" Last year when she was being hounded by the paparazzi outside her ballet class with her nanny, two-year-old North West gave photographers a serious dressing down. Adorably telling the prying paps, "I said no photos," North's words were cute, but also a poignant reminder about the inhumanity of paparazzi who seemingly have no boundaries, harassing small children who aren't even out with their celebrity parents. Way back in 2008, Sienna Miller sued photography company Big Pictures, claiming their paparazzi had become "intolerable". Miller filmed the invasive photographers with her own mini-cam as evidence, and ended up settling out of court. She has talked openly since about the burden of the paparazzi constantly hounding her, and isn't shy about discussing it publicly, as she did in her October 2015 interview with Marie Claire. Kristen Bell and hubby Dax Shepard have been vocal advocates against the paparazzi taking unsolicited photos of children, regardless who their parents might be. Bell launched the hashtag #NoKidsPolicy, which prompted celebrity tabloids including Access Hollywood, Entertainment Tonight, People, Us Weekly and Perez Hilton to stop publishing paparazzi images of children. Bell managed to really make a change in the tabloid media, and leads the charge in devaluing paparazzi photos of celebrity children — which will hopefully kill the demand for them, and lead photographers not to take the photos in the first place! Adele is a paparazzi defying hero, successfully suing for five figures after photography company Corbis Images U.K. Limited after they took and distributed images of her one-year-old son, Angelo Adkins. The photo company agreed to pay damages and legal costs for the photos, and will no longer keep the offending images in their archives or retain the right to distribute them in any capacity. While every other celebrity on this list opted for eloquence or the law when dealing with unwanted paparazzi, Jennifer Lawrence simply dealt with the paps by giving them the middle finger while exiting a London bar with ex-boyfriend Nicholas Hoult in 2014. And I respect that. It's simple, effective, and to the point. Katy Perry took her stand against the paparazzi to Twitter, after Australian paps offered her a "deal": a bikini photo in exchange for being left alone. Katy Perry posted an impassioned paragraph against the paparazzi on Twitter, calling their behavior "disgusting and perverted", which it was. She even posted photos of the perpetrators in an eye-for-an-eye move which had her followers hitting "like" and "Retweet" in the thousands. Like Perry, model Cara Delevigne took to Twitter to lash out at paparazzi last year. She said they made her feel like she was a "zoo animal" and that she felt like they would "ruin her trip". Delevigne asked the paps for empathy, and was backed by her followers en masse. Social media is a powerful tool for getting a point across indeed!